Basically, we owed this lot a return leg pasting. The worst afternoon many of the Whitley faithful had ever witnessed was the 6-1 thrashing at the home of our visitors. Nothing went right that day with crucial injuries and a distinct lack of substitutes meaning a miserable trip home on the first day of October. My first rant of the day came when we watched a number of cars parking in our car park so their owners could go and visit Aldi. Hasn't the supermarket got its own big car park? I think if someone parks in our car park then they should be made to join us at Hillheads! Where were our hordes going to park their cars? Parking rage got to me! 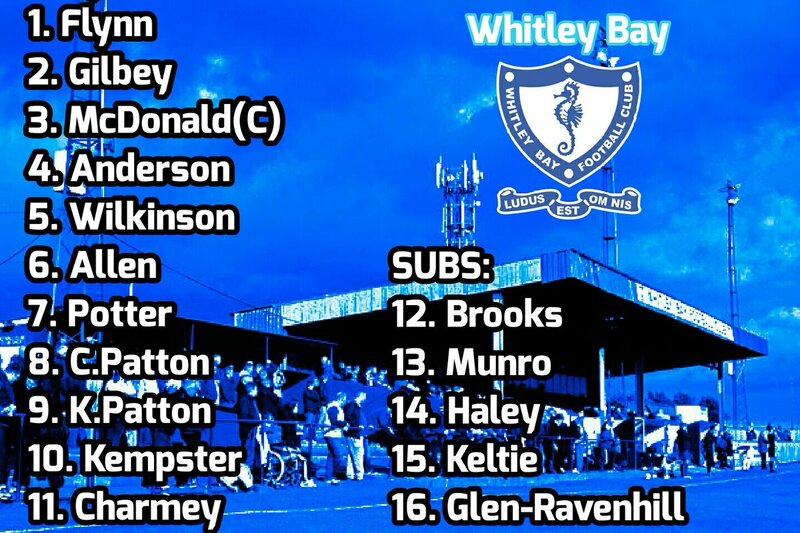 Mr Twitter had been working imaginatively of late to enhance the Club's Twitter feed and his latest offering was the team sheet picture. Seven of the 11 who had taken the field for the Bay in October were in the starting line-up today and it was nice to see our our own Eiffel Tower of a player, Thibault Charmey, given his place in the starting line up after featuring in a great team performance at Chester-le-Street which saw the Bay win 4-0. Also making his home debut was new signing and Durham Uni student, Tom Gilbey to bring the number of Toms on the team to 3...was this a Bay record? work put in by supporters and staff to flatten divots and cut it. Apparently though it wasn't rolled! The Tom Trio (and the rest of the team) started brightly and the Bay attack was causing the visitors problems, forcing errors in every position.However, as the half progressed, Red Star began to ease themselves into the game. Gilbey was looking confident and both he SuperMac were supporting our two wing wizards: Kempster and Potter. Also looking bright was Kyle Patton who was being sent chasing some great balls from big brother Callum. Unfortunately his lack of physical presence meant he generally came out second best to the larger visiting defence. After 16 minutes, it was our former favourite Birdy Bird who forced Flynn into a great save. This warning wasn't heeded and a few minutes later, Birdy was in on goal. The fit-again Wilkinson challenged him and was penalised by a penalty that Craig Lynch hit low to Flynn's right. Thankfully, the Prof wasn't booked. Next thing we knew, Callum A. was booked for kicking out at a Seaham midfielder as he was disappearing off into the horizon. The game had been turned on its head. Next Callum Patton did an excellent impression of Superman as he avoided any contact with a defender's foot by flying horizontally over the challenge. The extremely tall linesman was only able to rely on his bird's eye view so he flagged for a penalty. Nice one! As the former Voice of the Bellend put it..."I could have fitted my grandma into that gap..." He's been missed! Better was to follow as the Bay went onto the attack again. This time it was Monsieur Charmey who robbed a defender and rolled the ball across the goal. We (me and the Boy Mark) thought that it had hit a divot and bounced past the unhappy Shawn Newbrook in the Seaham goal but it turned out to be Kempster's outstretched foot. A much happier half time crew headed for Tommy's. Unfortunately just two minutes into the second half, Professor Wilko employed a less than studious tackle to give away another penalty that was confidently dispatched by Lynch again. Seaham went on the offensive and with 18 minutes remaining took the lead. Bradley Staunch powering a header home to make it 3-2. Revenge for October looked unlikely. Then it was the Bay's turn to wake up for the rest of the match as they battered the visiting defence. Marshalled well by Wilko and Nick Allen, the defence pushed up the pitch as a unit to deny the Seaham midfield any time or space space to operate in and time and again they picked up clearances and began setting up attack after attack. The exhausted Thibault was replaced by Brooks and Callum Anderson by Peter Glen-Ravenclaw sorry, Ravenhill and the visiting defence were creaking. Brooks finished off a great move at the far post only to be denied by the offside flag and Newbrook was being tested from every angle. With the game looking over, it was Super Gilbey who effortlessly curled the ball past Newbrook's outstretched arm and into the top corner of the net! 3-3: hardly a reward for the possession and effort put in but justly deserved. As a footnote: Morpeth Town were winning 4-2 at ten man South Shields when the floodlights failed with 7minutes remaining of their FA Vase tie. Did someone forget to put 10p in the meter?